Harrisonburg was established as the county seat of Rockingham County in 1779 and developed into an agricultural powerhouse in the 19th and 20th centuries. 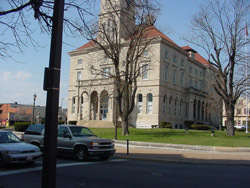 The City’s downtown historic district is centered around Court Square, which is dominated by the impressive courthouse. Harrisonburg has what cultural geographer Edward T. Price defines as the “Harrisonburg Plan,” with streets that intersect or are tangential to the sides of the courthouse square. 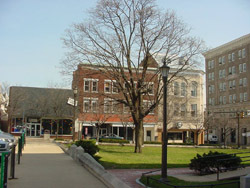 In his seminal article on America’s courthouse squares, Price cited Harrisonburg as the earliest known occurrence of this plan, which later appeared in Georgia and Ohio. From early stone, brick and log houses to more commanding commercial buildings of the late 19th and early 20th centuries, Harrisonburg’s downtown presents a wide range of buildings that reflect the town’s history. As the county seat, Harrisonburg naturally developed as the commercial hub of Rockingham County, which by the antebellum period had grown into an agricultural powerhouse. In 1850, Rockingham County was the largest producer of wheat and hay in the state. A handful of buildings remain from the antebellum period, including the Hardesty-Higgins House at 212 S. Main, which now are the offices of Harrisonburg Downtown Renaissance, and the Warren-Sipe House at 301 S. Main, which currently houses the Virginia Quilt Museum. The Baltimore and Ohio Railroad reached Harrisonburg in 1868, which contributed to the community’s growth. Stylish homes were constructed along Main Street, such as the grand Queen Anne Joshua Wilton House, constructed in 1890, and now a bed and breakfast. 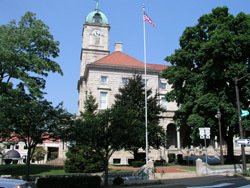 A watershed event in Harrisonburg’s architectural and civic development was the construction of the present courthouse in 1896-1897. The imposing Romanesque/Renaissance Revival style building was the work of prolific Staunton architectural firm T.J. Collins & Son and Washington, D.C. builder W.E. Speirs, and it introduced a new level of sophistication to the downtown. Harrisonburg during the early 20th century continued to benefit from the agricultural bounty of the surrounding countryside. Poultry production became increasingly profitable as the century progressed, and Rockingham County became a national leader in the poultry trade. Out of this success in the poultry industry came a range of specialized building types constructed in the 1910s through the 1950s, including hotels, warehouses, factories and service stations. The Chesapeake Western Railways station, built in 1913 at 141 West Bruce Street, fostered the growth of an industrial and warehouse district along what became known as Chesapeake Avenue. In the 1960s, Harrisonburg followed a national trend of demolishing vacant or older structures to make way for new buildings. Over the last 30 years, several revitalization initiatives were undertaken by citizens’ groups or the city. Each effort was met with some success, however the work was not sustained due to the all-volunteer effort and lack of sufficient funding. With the organization of Harrisonburg Downtown Renaissance in 2003, there is new optimism that downtown revitalization will continue to be a public and private priority. Rehabilitation projects are now underway, including the conversion of the prominent Wetsel Seed Company Building into apartments and offices, as well as a major streetscaping project for the downtown. Harrisonburg became a designated Virginia Main Street community in 2004. The Harrisonburg Downtown Historic District is located primarily along Main St. between Kratzer Ave. and Grace St. Harrisonburg Downtown Renaissance is located at 212 S. Main St. and is open from 9:00am to 5:00pm, Monday-Friday. For more information about shopping, dining and events call Harrisonburg Downtown Renaissance at 540-432-8922.